It seems like every time we think we've reached the peak, the upper limit of what a single back yard can contain, we're proven wrong. 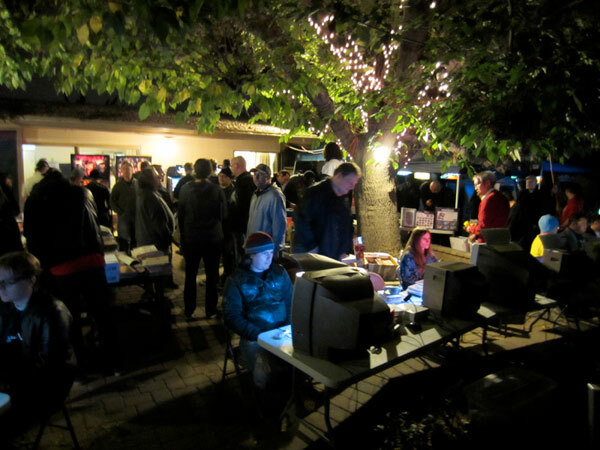 The latest meeting of the Southern California Classic Collectors (SC3), held November 15, 2014, was another back-yard blowout, straining the capacity of the premises and, doubtlessly, the electrical grid. 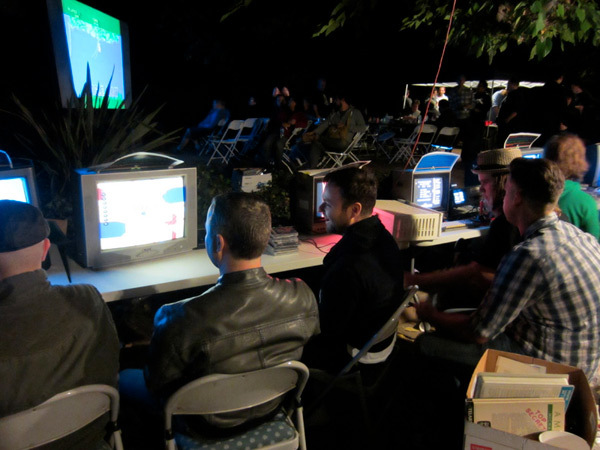 Over 200 attendees streamed into the yard this time, threading their way through over 30 full- and over-sized arcade machines, over one dozen vintage consoles, two pinball machines, and endless tall stacks of video game items up for trade. It was another memorable SC3 party! We knew this was going to be a big event when we received 78 "definitely going" and 28 "maybe going" responses within just 12 hours of announcing it. The responses surprised us, but we weren't overwhelmed. We've finally put on enough of these things to have some idea of what needs to be done. And we knew we can always count on our friends to come through. Mike K. from [url=http://www.gamegavel.com"]GameGavel[/url] never lets us down, and he brought yet another great spread of raffle items despite being busy helping out Classic Gaming Expo and RETRO Magazine. 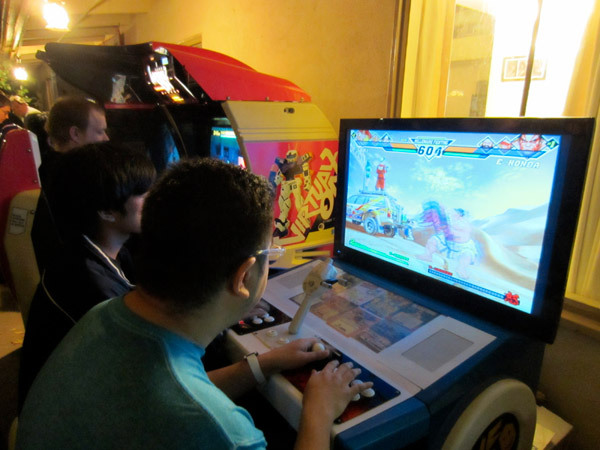 William showed up with the Turbo Duo and Neo Geo AES with studio monitor setup he's brought before, but also brought along a huge Tournament Neo Geo sit-down arcade unit. Mike M. brought the Star Trek: TNG and Terminator 2 pinball machines, and the very impressive two-player sit-down Virtual On machine. 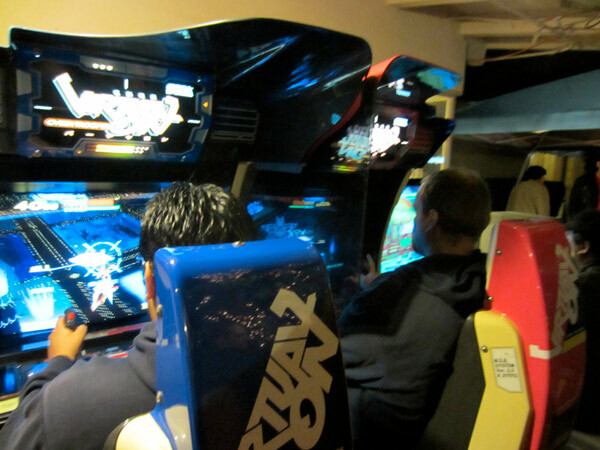 We were particularly excited by the oversized machines like Virtual On and the Neo Geo Tournament console. These don't turn up at SC3 events very often because they are tough to move around. (Ever try to fit Virtual On through a doorway?) Having two-player beasts like this at SC3 has long been a daydream of ours, and we owe a lot of thanks to the folks that brought them. Being able to set them up next to pinball tables &ndash; another relative SC3 rarity &ndash; was all the sweeter. That's not to give the smaller machines short shrift. Mike M. continued the two-player vibe by bringing along Mario Bros., a cabinet that's been at SC3 events before but not very often. Midway's trackball classic Kick-Man was a new addition; as far as we can remember it's never been at an SC3 event before. Console-wise, this party marked the SC3 debut of the Nintendo Virtual Boy (courtesy of Steven from Pop Culture Maven), which proved to be somewhat of a surprise hit. 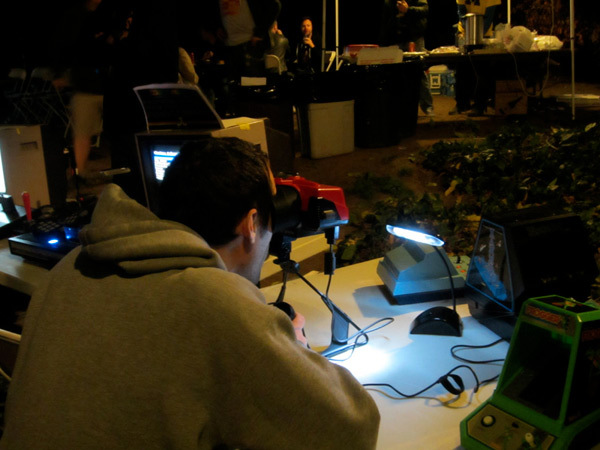 It seemed that the Virtual Boy was continually occupied, attracting players eager to experience the system's unique blend of 3D effects and headache-inducing, blood-red visuals. This is one machine that truly furthers SC3's goal of making you enjoy video games so much that you leave feeling vaguely uncomfortable. 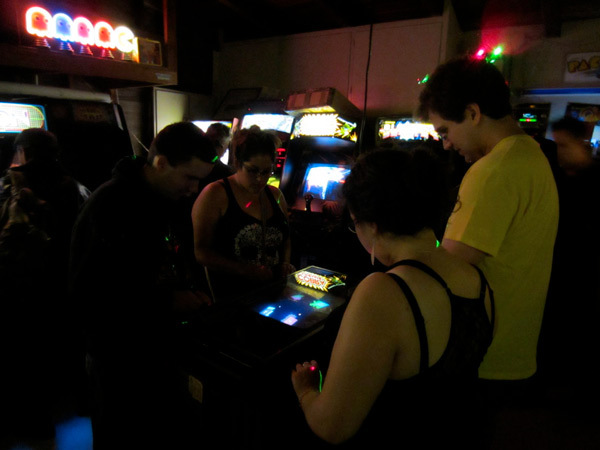 Next to Virtual Boy was the usual complement of vintage '80s tabletop games, courtesy of Rik from Handheld Museum. Beyond those were over one dozen other vintage home machines, from the Atari 2600 to Sega Dreamcast with just about everything in between. Robert B. from FCUG supplied an Amiga setup, and a replacement Commodore 64 when ours developed sound trouble. Jason B. lent us some multicarts for the night. Thanks to a truly team effort, this event was overflowing with hardware! The sharing didn't end with hardware. A few attendees showed up with drinks and food, including a big pan of brownies decorated like a Pac-Man screen, and a platter of mini-cupcakes frosted to look like Pac-Man and Kirby. These snacks were a great compliment to all the cookies, chips, and over 55 pizzas consumed during the course of the night. The stack of spent pizza boxes left over in the morning was truly monumental. Thanks again to everyone who helped out (with a special shout-out to Chris N. and Ian), and THANK YOU to everyone who attended and chipped in a donation to keep us going. Your support is always appreciated! The next SC3 arcade party has yet to be announced, but if our normal schedule holds, it should be around the spring of 2015. We're scoping out possible new locations for the next event. As always, keep an eye on this site and our Facebook page for announcements. Until then, keep gaming!